Wheels requiring a structural damage repair will need to be inspected and surveyed by one of our technicians and a cost and time frame will be quoted, subject to the extent of the damage. The tyre, valve and any balance weights are removed. To strip the old paint from the wheel it is then dipped in a chemical tank. 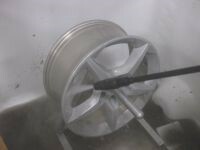 Any visible kerb damage is then repaired using hand tools and any deep gouge marks are filled with a high temperature alloy filler. 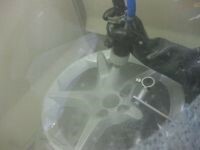 The wheel is then placed in an aqua blast cabinet. 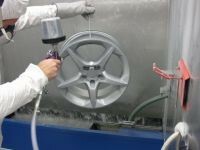 This will prepare the wheel for the surface coat primer and also remove any surface contaminants. To degas the wheel and to burn off any contaminants, the wheel is placed in an oven and heated to 200 degrees for 25 minutes. 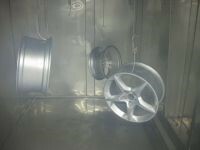 After degassing the wheel is hot enough to have powder coat primer applied. This procedure is carried out in a clean room with filtered roof panels to further reduce any contaminants adhering to the wheel. Once primed, the wheel is then placed back into the oven for another 20 minutes. This allows the powder coat to flow out to leave a smooth flat surface to apply the paint on. The base coat is then applied to the wheel. 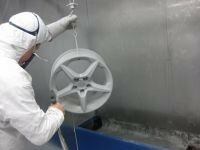 The wheel is allowed to cool before we apply the powder acrylic lacquer. 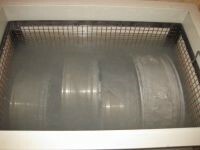 For its final curing, the wheel is then placed back into the oven. 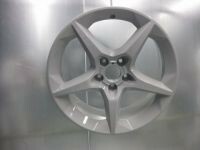 The alloy wheel is fully refurbished. 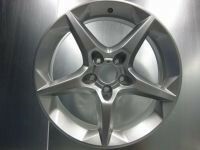 Alloy Wheel Full Refurbishment Quote Request.